When we say ‘Esplanade’, do you only think of the festivals and concerts that take place all year round? Well, the performing arts centre that is nicknamed the “Durian” is home to more than just the artsy stuff, especially during Esplanade Mall’s annual weekday lunchtime promotional period! From 12th May to 1st August 2014, cave in to a gastronomically delightful escapade and feast at Esplanade Mall with a party of friends with the 3-for-2 promotion (www.esplanade.com/3isnotacrowd). Yes, you’ve got that right. For every 3 main courses, you only pay for the price of 2. And to sweeten the deal, with every 3-for-2 receipt, you enjoy complimentary parking for 3 hours! Not only that, the first 20 to present their receipts will receive a $5 shopping voucher for use at Esplanade Mall retail stores. Two is company but three is definitely not a crowd! Maybe you never knew, but Esplanade Mall is quite a food heaven in its own rights. There are cuisines of all kinds to pamper all palates and preferences. We can dine there twice a week and not repeat any of the dishes we had! Every restaurant has its selection of dishes, so we went on a food trail and curated our favourites from this promotion. Barossa is one of our favourite places at Esplanade Mall, and this year, it continues to impress with its selection of main courses like Guacamole Chicken Burger, Braised Beef Stew, Aussie Bangers, and the tantalising Smoked Duck Linguine. A 2-course menu with soup/salad and main course is only S$14++. With the fantastic 3-for-2 promotions, each person only pays S$9.3++ for the 2-course set lunch. They also have a main course option at $10++, and 3-course option (includes a dessert) at $18++. Coffee connoisseurs must take this chance to head to Blue Mahoe Estate Caffe for the world-famous Blue Mountain coffee. With any two cups of coffee purchased (from S$14++ each), you get a free cup of Blue Mountain No. 2 coffee. Also, 1 sticky date pudding is free with any two desserts purchased (from $12.90++ each). Over at Chocz., besides stopping for your favourite gourmet chocolates, do a quick lunch and grab an Egg Mayonnaise Sandwich or a Tuna Sandwich for S$13.90++, or Swiss Cheese & Tomato Sandwich or a Ham & Cheese Sandwich for S$14.90++. It is offering Pulled Chicken Burger (S$8.90++), Smoked Salmon Burger (S$9.90++), and Duck Rillette Burger (S$8.90++) for the 3-for-2 lunch deal. It works out to an average of just S$6++ for each burger when you dine with 2 other friends under this promotion! Grand Pavilion Cafe has taken over the premise which used to belong to Space @ My Humble House, and it has continued the winning formula of serving a selection of popular local dishes (S$11.90++ each) that are expertly prepared using delectable ingredients, such as Jumbo Prawn Noodle Soup, Penang Assam Laska, and Fried Carrot Cake with Seafood & Homemade XO sauce. Grand Pavilion Cafe is closed for renovations from 12 May to 31 May. Enjoy the lunch offers from 2 June onwards. If you love Häagen-Dazs as much as we do, you are in for a treat! 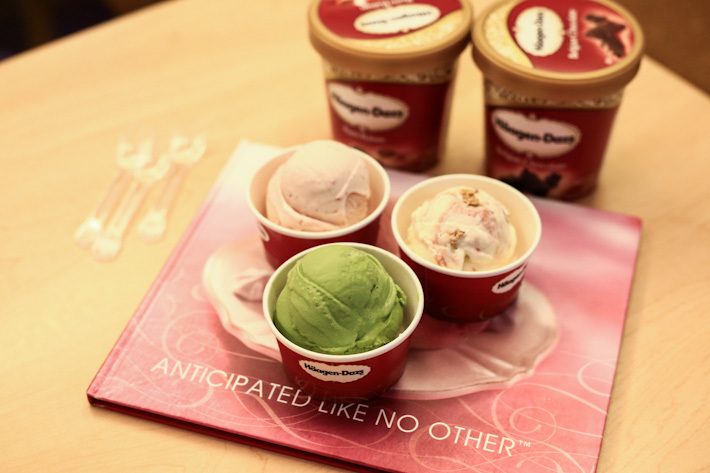 A single scoop in a cup is S$5.90++, but you get to enjoy three scoops for the price of two. Yippee to more ice cream! One of the places at Esplanade that I always look forward to visiting is Max Brenner Chocolate Bar. Who can resist luscious chocolate treats like chocolate fondue, peanut butter chocolate crepes, and chocolate lava cake? 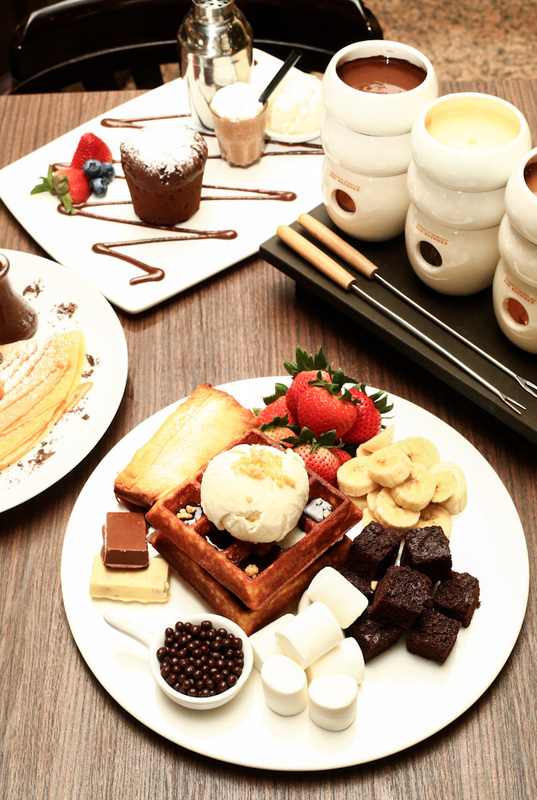 The good news is all desserts on Max Brenner’s menu (from S$16++ onwards) are available for this promotion. Get your friends and head down for a delicious dessert party! Specialising in both contemporary and local heritage dishes with an Asian influence, Ninethirty by AwfullyChocolate is offering a set lunch with pasta and drink (excluding alcoholic beverages) for only S$15++. 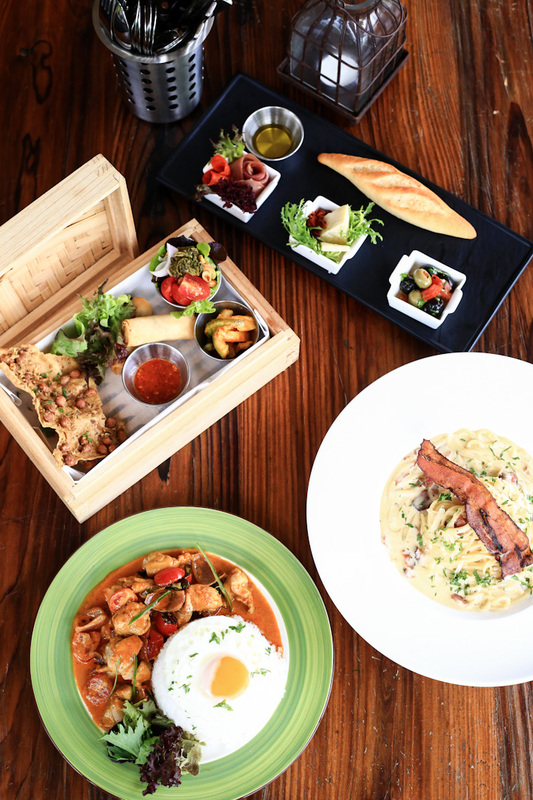 Options include Duck Confit Linguine, Laksa Tagliatelle, Pink Salmon Linguine, Seafood Marinara and Miso Aglio Olio. For something different, drop by Simply Peranakan Cuisine for traditional Peranakan food. There are 4 sets to choose from – Chicken Drumlet Rice set (S$14.90+), Pork Rice set (S$14.90+), Beef Rice set (S$15.90+), and Fish Rice set (S$15.90+). With its al fresco area and a rooftop bar, Supply & Demand Modern Bistro & Rooftop Bar is a great place for a relaxing weekday lunch with friends and colleagues. They focus on Italian and South East Asian cuisines, and you may expect a combination of mouthwatering street food – from Malaysia, Indonesia, and Burma – presented in a modern way. There are two options for its 2-course menu (S$16.90++) – an Asian inspired lunch set which comes with familiar Asian dishes like Malaysian Sate, Pad Ka-Prao, and Zi Char style Curry Chicken; and an Italian lunch set with a variety of pastas and pizza. Tom Yum seafood soup, Massaman Chicken Curry, Poo Phat Pong Kari… If you love all these signature Thai dishes from ThaiExpress, you probably won’t need any convincing. Esplanade Mall’s 3-for-2 promotion includes all main courses on ThaiExpress menu (S$10.30++ onwards). It is the perfect chance for you to indulge your favourite Thai dishes! For Esplanade Mall’s 3-for-2 lunch deals, Tomo Izakaya is serving an extremely value-for-money 3-course set lunch (soup/salad, main course and dessert) at S$15 nett. Choice of main courses includes Grilled Salmon with wasabi mayonnaise, Niku Jyaga Rice (thinly sliced simmered beef with potato and half boiled egg), Tonkatsu-don, Tempura Udon/Soba, or Kimchee Ramen. 3-for-2 lunchtime deals Applicable for dine-in on weekdays only, excluding public holidays. Timing of lunch hours may vary across outlets. Complimentary item must be of equal or lesser value than the lowest-priced item purchased. The promotion is not applicable with other promotions, discounts, vouchers and other offers by credit or privilege cards. Esplanade Mall and participating tenants reserve the right to amend the promotion and terms and conditions without prior notice. Free lunchtime parking Valid for the first 3 hours between 12pm – 5pm. Redeem the complimentary parking coupon by 5.30pm with same-day receipts at the Esplanade Concert Hall Information Counter (10am – 9pm). S$5 shopping voucher The first 20 to present their receipts at the Esplanade Concert Hall Information Counter (10am – 9pm) will receive a S$5 Esplanade Mall shopping voucher for use at retail stores. Only one voucher issued per redemption. The vouchers can be combined for use, and there is no minimum spend required to use them. This post is brought to you by Esplanade Mall. Hi, think you should advise against Barossa. We went in a group of 6 one weekday, arriving just before 12pm. There was only 2 other tables (4 & 2) occupied, so we sat down. Bearing in mind weekday lunch means we have to be back in office within the hour, the ordering and serving took almost 45 minutes, with wrong and under-cooked orders. (For the wrong and under-cooked orders, they merely changed / cooked the main, re-fried the fries, returned you the half eaten side salad, and served you back on the same platter.) Food was too salty for our tastebuds too. One of us ordered Guacamole Chicken Burger, but there was NO trace of Guacamole (unless this is the new avocado-less version) at all.